Has the cat got your tongue over these friendly felines? We understand purrfectly! Our 'Copy Cats' Dress & Leggings Set, exclusively for pouncing-around TWIN GIRLS, is designed with our uniquely-created pattern combinations to compliment rather than copy, allowing each twin to show off her own sense of style and individuality. 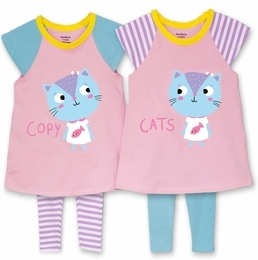 These super-soft A-line dresses are adorned with cute, cuddly kitties with accented embroidered lettering, offering a fashionable and comfortable fit. Complimented with stretch leggings with a soft, elasticized waistband, these outfits provide all-day comfort for busy twin girls on the go!